Construction on the swooping structure of a twin-towers project in Lusail Marina is expected to start soon, with the launch this week of tenders for a main contractor. 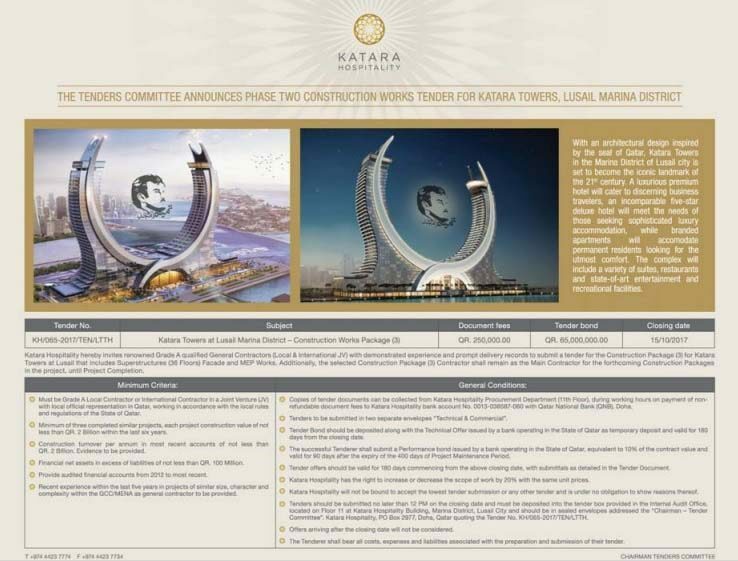 Katara Hospitality opened the application process for a contractor to build the 36-story, crossed-swords design Katara Towers. The towers’ curves are inspired by the crossed swords of the seal of Qatar, and were designed by German civil engineering and design firm King Consult. When complete, the complex will house two hotels, luxury apartments, restaurants and entertainment and recreation facilities, according to the notice on its website and in local media this week. Katara Hospitality first launched the towers project in May 2012, and at that time aimed to finish by 2016. At the time, the total budget for the project, covering a 300,000 sq m area, was QR2.2 billion. Since then, progress on the project has been stop-start, and subsequent deadlines have come and gone. Enabling and piling works got underway in late 2013, and in December 2014, Katara Hospitality tendered for subcontracting and basement works packages. According to its website, the towers are now scheduled to open in 2020. The state-funded hospitality group said it is currently looking for a Qatar-based contractor, or a joint venture with local official representation. They will be tasked with building the above-ground structure and facade and to handle the MEP works. The successful bidder will also be appointed as main contractor for the rest of the works to the project until it is finished, the notice states. Eligible bidders should have done at least three similar projects in the last six years, each valued at QR2 billion or higher. They must also show experience in constructing projects of a “similar size, character and complexity” in the Gulf or MENA region in the last five years, the notice said. The deadline to apply is Oct. 15. 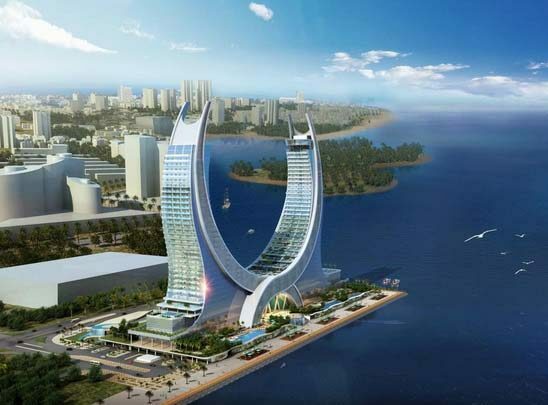 Once completed, the towers will be among Lusail City’s landmark buildings. It is located in the marina district, which is still under construction. It is already home to the multi-colored Marina Twin Towers, among other buildings. Previously, an artificial beach island was planned, to be linked to the towers’ promenade by bridges. It was slated to host aquatic sports, restaurants and contain water parks, Katara Hospitality previously said. However, there was no mention of the beach island in the latest notice. Some 20km to the north of Doha, Lusail is being built from what was empty desert. The aim is to eventually house nearly 200,000 people by 2022, and half-a-million residents when it is fully complete. At that time, visitors to the “city of the future” will be able to get around via light rail, water taxi or through a cycle and pedestrian network. Construction on the marina district has been underway for years, and a number of towers and other projects are already complete, although progress in some parts has been slow. Lusail will also be home to Qatar’s showpiece stadium when it hosts the World Cup in 2022. A Qatari-Chinese JV was announced late last year as the main stadium contractor. But the design for the arena – being undertaken by British architectural firm Fosters + Partners – has yet to be publicly revealed. Among the stops on the light-rail is Place Vendôme. 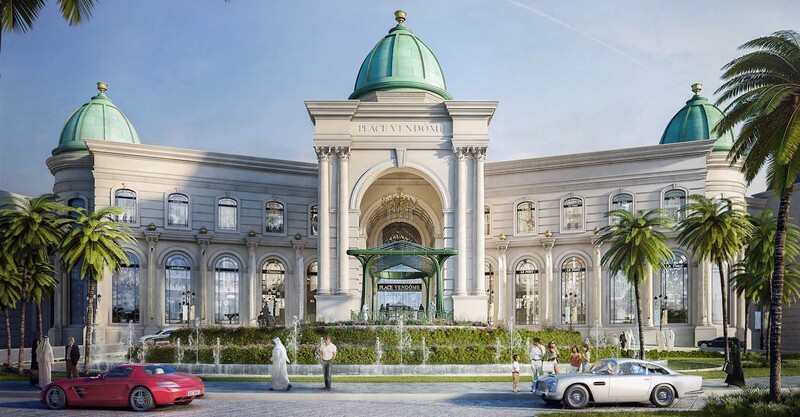 The QR4.6 billion mixed-use, Parisian-inspired development will have a shopping center with up to 500 retail outlets in a 1 million square meter area. Scheduled to be finished next year, it will include a a hypermarket, entertainment zones, restaurants and two five-star luxury hotels and serviced apartments.